2015 Top Metals Mining Companies in the World, Forbes Global 2000. Mind Map. Elearning. 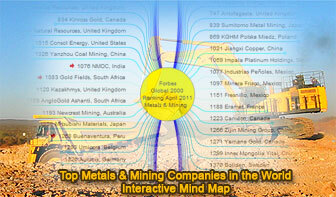 Mind Map based on the Forbes Global 2000 Leading Companies, Industry: Diversified Metals & Mining. Retrieved Jan 2, 2016. The Forbes Global 2000 is an annual ranking of the biggest 2000 public companies in the world by Forbes magazine. The ranking is based on a mix of four metrics: sales, profit, assets and market value. The market value calculation is as of March 11 closing prices, including all common shares outstanding. Mining is the extraction of valuable minerals or other geological materials from the earth, usually from an ore body, vein or (coal) seam. Materials recovered by mining include base metals, precious metals, iron, uranium, coal, diamonds, limestone, oil shale, rock salt and potash. Any material that cannot be grown through agricultural processes, or created artificially in a laboratory or factory, is usually mined. Mining in a wider sense comprises extraction of any non-renewable resource. Source: Wikipedia, Mining.